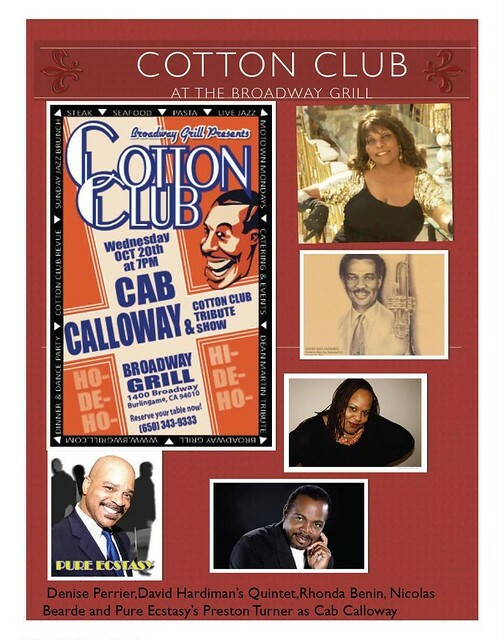 Denise Perrier, David Hardiman’s Quintet, Rhonda Benin, Nicolas Bearde and Pure Ecstacy’s Preston Turner as Cab Calloway in the Cotton Club Revue. This entry was posted on Monday, October 18th, 2010 at 5:41 pm. It is filed under Music News/Info and tagged with Broadway Grill, Burlingame, Cotton Club Revue, David Hardiman Quintet, Denise Perrier, Nicolas Bearde, Preston Turner, Rhonda Benin. You can follow any responses to this entry through the RSS 2.0 feed.